Since September I have worked with the WCS Library and Archives in their ongoing effort to digitize historical photographic holdings. My focus has been on a collection documenting one of the expeditions made by the Society’s Department of Tropical Research. 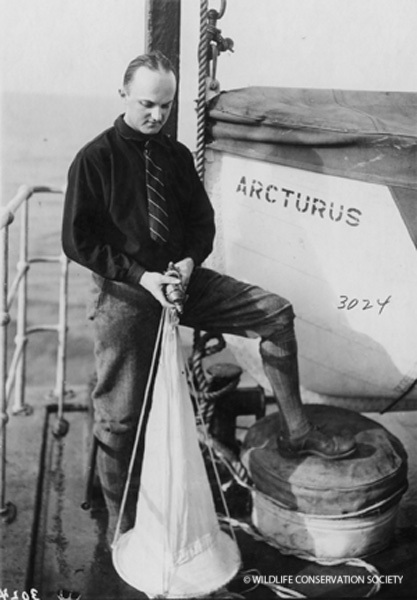 William Beebe led this 1925 expedition from New York to the Galapagos on a ship named Arcturus. 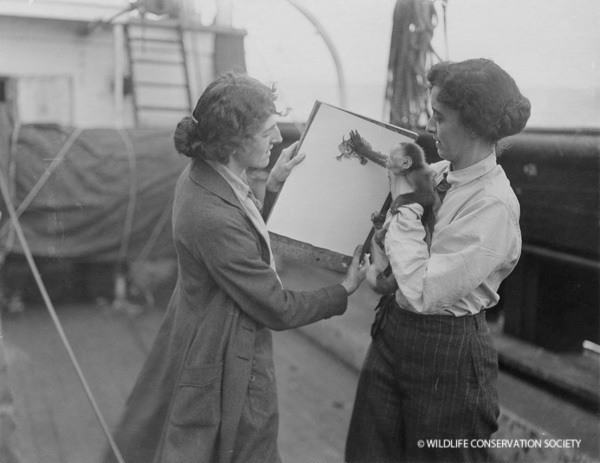 William Beebe (right) and crew members compare illustrations and specimens on board Arcturus, 1925. WCS Photo Collection. Beebe had a large and diverse crew, including several women, ranging from scientists and historians to artists. Charles Fish and his wife Marie specialized in vertebrates and larval fish. Artists were important to recreate specimens and to capture their true colors while still or recently alive. Many photographs depict artist Isabel Cooper at work with pad and pencil. Another artist on board was Dwight Franklin who was an illustrator as well, but who also made plaster and clay models of the specimens. The historian and technicist Ruth Rose was often photographed with the crew’s pet capuchin monkey Chiriqui. Ruth Rose and Chiriqui admire Isabel Cooper’s work, 1925. WCS Photo Collection. 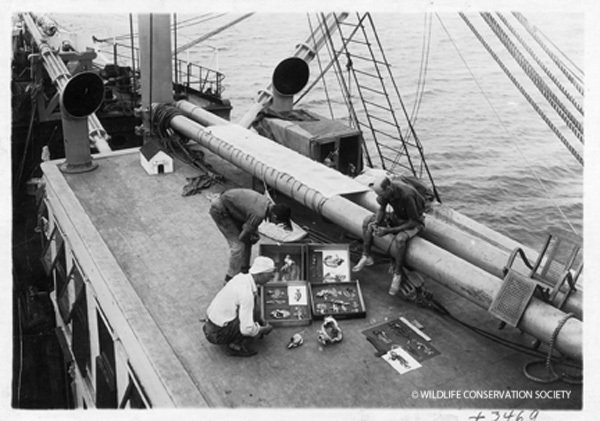 The collection documents the researchers and ship crew at work, mostly on board the Arcturus. 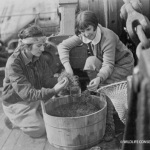 The photographs depict hauling nets on deck where they sorted the hauls’ contents of sea creatures and seaweed. They capture the researchers at work in the Arcturus‘ laboratory: writing, painting, discussing. There are also photographs of the crew’s leisure time. Ruth and Isabel sit on the ship’s edge, legs dangling. William Beebe welcomes well-dressed guests aboard, such as donors Herbert Satterlee and Henry Osborn. 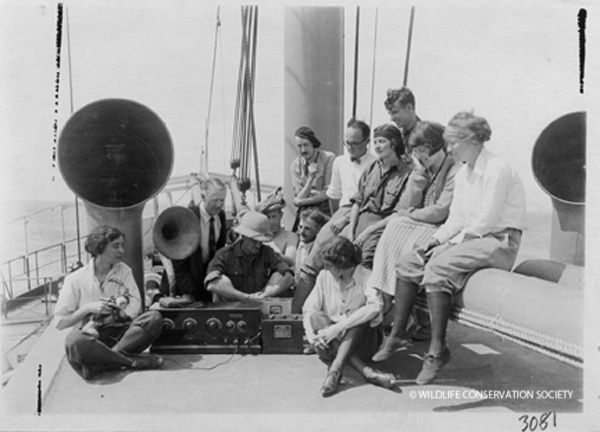 In one of my favorite photos, the whole researcher crew (and Chiriqui too) sit encircling a radio on the ship. Some of the images in this collection document scenery and activities outside the Arcturus; many of these feature local wildlife. There are scenes of rocky Galapagos shores peppered with boobies. The ship’s captain plays on shore with a sea lion. Researchers measure and document frigate birds and giant iguanas. The Arcturus crew gather around a radio, 1925. WCS Photo Collection. This collection, including many rare and previously unavailable photographs, provides so much insight into the expedition and to Beebe’s narrative. It also captures the interesting attire and equipment from 1925, and many of the images are quite beautiful and artistic. The digitization of this collection is a cultural boon, useful and interesting to many potential viewers. Those seeking visual aids to their research regarding Beebe’s expedition or early-twentieth-century scientific endeavors in general, lovers or researchers of early photography, animal and nature lovers, or really anyone with a curious mind, would find these images wonderful. Charles Fish handling equipment on the ship, 1925. WCS Photo Collection. I myself have really enjoyed spending time with these fascinating photographs and researching a bit about the scientists and artists. One thing I enjoyed learning was how Beebe (whether intentionally or not) promoted gender equality by staffing his expedition with both male and female scientists and artists. I was surprised to see this type of progressive commitment to equality at that time period. I came to work for the WCS Archives so that I could gain some hands on experience regarding the concepts I studied in college. This internship has provided that and much more; it has been a delight working with the Arcturus collection. 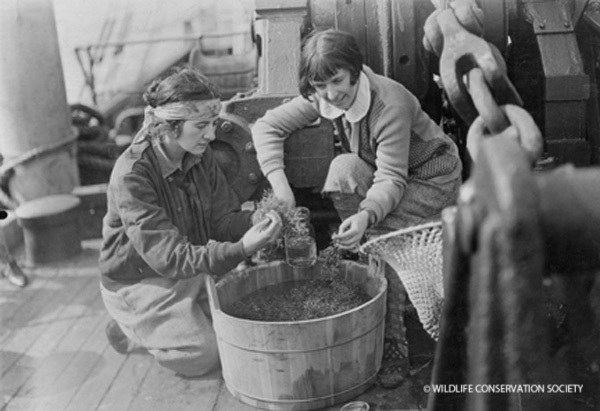 Isabel Cooper and Marie Fish sort through sargassum weed, 1925. WCS Photo Collection. This post was written by Allison Grillo, who served as Photo Archives and Digital Management Asset Intern with the WCS Archives during Fall 2014. 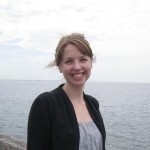 Allison is a recent MLIS graduate of Pratt Institute. She lives in Brooklyn and is interested in continuing archives work in the nonprofit sector. I am conducting a historical reconstruction of fishing in Galapagos and it will be great to have access to this photo archive from W Beebe expeditions to the Galapagos islands. How could this be possible? We are in the process of scanning many of Beebe’s images. I’ll get in touch with you under separate cover about your request. This is a great post! Isabel Cooper was my great-grandmother, and the Mahaffie family is excited to learn that there are more photos etc. from Isabel’s work than what we’ve seen. Can you tell me if at any point it would be possible for me to make a research visit to look at the collection sometime in the future, or other ways to access it (once the scanning is further along)? My parents, Ralph and Mildred Buchsbaum were marine biologists and spent the summer of 1938 or 1939 in Bermuda making photographs of invertebrates for their text “Animals without Backbones”. The brought home a set of 8 cocktail glasses painted with tropical fish, said to have been painted by William Bebee. However, the glasses seem to me to be more in the style of Isabel Cooper or possibly Helen Tee-Van. We wondered if anyone had knowledge of glass painting by any of the Bebee associated artists. Are any photographs associated with Beebe’s stations in Guyana digitized? I don’t see links on the digital collecitons page (http://ielc.libguides.com/content.php?pid=407630&sid=3336624). I work on the history of 20th c. tropical stations and would be interested if these exist. I love the pictures of my grandparents. Dr.charles J. And Marie P. Fish. Known to me as Bobbie and Gampy. So glad you found these, Ted! What did the Fishes go on to do after they were on the Arcturus? My father was Jay F.W. Pearson, one of the participants in the Arcturus expedition (see https://johnmahaffie.com/isabel-coopers-arcturus-expedition-colleagues/ His picture is #7) He went on to be president of the University of Miami and I remember (if I recall correctly) Don Dickerman dropping by our house one night trying to interest my dad in some kind of diving mask that my father was prepared to have me model in our swimming pool. Dickerman was really unlike anyone else I had ever seen come to our home! I’d love to be able to look through the photos from the Arcturus expedition as would my son and daughter.